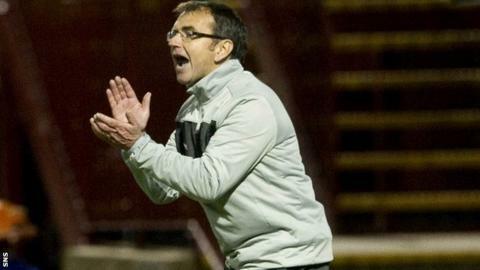 Pat Fenlon praised his Hibs side after they moved up to second in the SPL with a thumping victory at Motherwell. The Edinburgh side ran out 4-0 winnners, with Leigh Griffiths scoring two from the penalty spot. Motherwell were unhappy that a Stevie Hammell header was not awarded as a goal, but Fenlon believes his side deserved the win. "It's a massive win for us tonight, although I know we got a bit of luck. We played well," said Fenlon. David Wotherspoon's superb strike gave Hibs the lead and Motherwell thought they had equalised through Hammell's header but Hibs goalkeeper Ben Williams clawed the ball away after it appeared to have crossed the line. Griffiths converted penalties either side of Michael Higdon's missed spot-kick for the hosts and Danny Handling netted Hibs' fourth to compound Motherwell's misery. "According to some of our players, some of the decisions may have gone for us," said Fenlon. "But I'm delighted for the players. I haven't seen it yet [the Hammell header]. It looked like a good save from our point of view, but we should be talking about our first goal as well because it was fantastic. "There was some good football in the game as well. I know, obviously, there will be talk about what went on with some of the decisions but there was good football from both sides too. "Leigh is a handful up front and he's that type of player who can play with somebody but he can also play on his own." Fenlon added: "Until we got the fourth goal you're always worry that you'll concede and get a bit edgy. "But I'm delighted for the players and the staff because they've worked really hard since [the defeat by] Ross County."